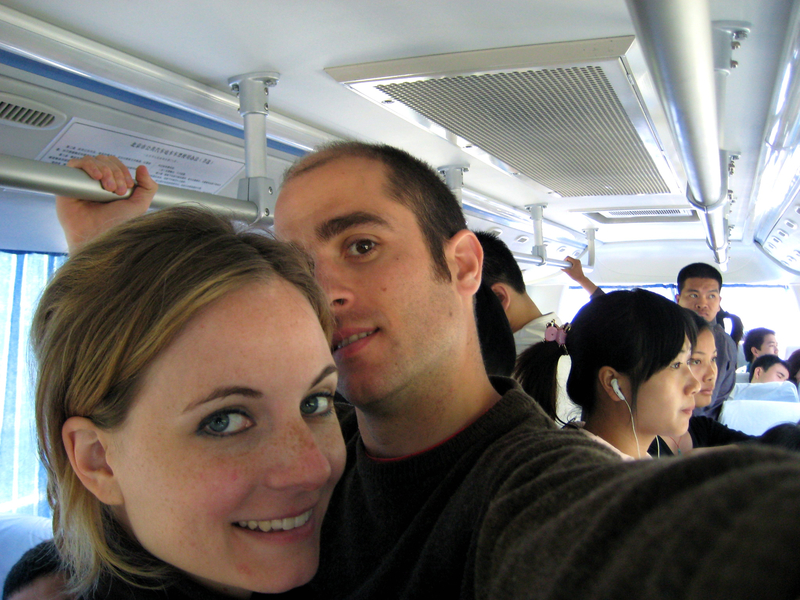 We heart public transportation. Our fondest memories from our trips are often of navigating byzantine bus routes, miming our desired destination and generally making a mess of things to get from point A to point B. In many cases, we become so engrossed in finding a way to get somewhere on public transportation that where we’e going gets second billing. That night at the hostel, I hopped online and figured out the 919 departs from the Deshengmen bus terminal that was a 10-minute walk from our hostel. We set out the next morning and found nearly an entire block of 919 buses. 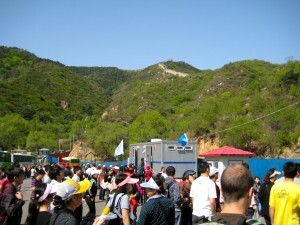 At each one we stopped and said, “Badaling?” And each time the driver indicated to keep going back. At the very end, we reached a crowd of Chinese people who confirmed that we were in the right place for the 919 to Badaling. In all of this, a tout came along and started poking A. with a stick, trying to convince us to go with him in a private car. Then the tout tried to convince our teen translator to convince us to go in the car and that he would bring the teen and his gal for free. And then, after a very long while, somebody figured out that the 919 buses were leaving from around the corner and we all started moving. Now is a good time to mention that it was Saturday May 2nd, the day after May 1st holiday. What we found around the corner was a massive free-for-all with some semblances of a queue, presumably filled with everyone who had come to Beijing for the long weekend, or who had wanted to go to Badaling the day before and didn’t because of the poor weather. Or maybe it’s like that every day. We didn’t try it again to find out. 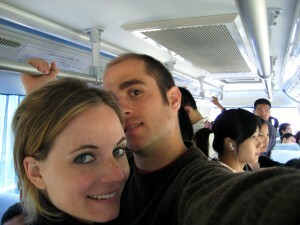 We finally made it on to the 919 bus to Badaling! We stayed close to our teenage friend and somehow, miraculously and breathlessly, got straight on a bus without any wait at all. Owing to the crowds, we had to stand on the bus, which we didn’t mind. As it was a holiday weekend, the bus had a young guide who explained things throughout the ride, in Mandarin, of course. At one point, something he said made everyone laugh and look at us. The ride to Badaling was only about an hour, but a bottleneck of incoming buses meant about another 30 minutes getting to the spot to let us off. We parted ways with the teen, who was going to take the pulley chairs up, and continued by foot. Badaling is what it is. A sad bear in a cage, strange attractions, vendors pushing one thing or another on you at every turn. 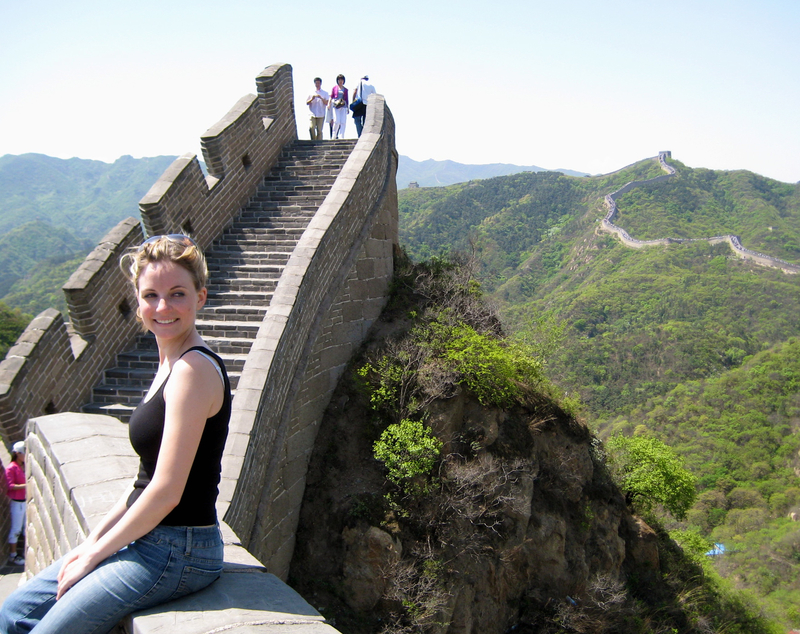 We knew this when we chose Badaling over a more expensive excursion to a different part of the wall, so we took it in stride. We walked for a couple of hours, scrambling at the steepest sections. Despite the tourists, the touts, the epic bus ride and all the rest, we were at the Great Wall, which is really something. When we looked out at the rolling green mountains, we understood why a place to see approaching enemies would be necessary, and why anyone would want to protect that land. It’s one of those places that make you feel like a speck in the universe. The first stones were laid 1,500 years ago, the Ming Dynasty undertook a major reconstruction 1,000 years later, and 600 years after that we were standing on it. Metro Jishuitan, then walk to Deshengmen bus terminal. 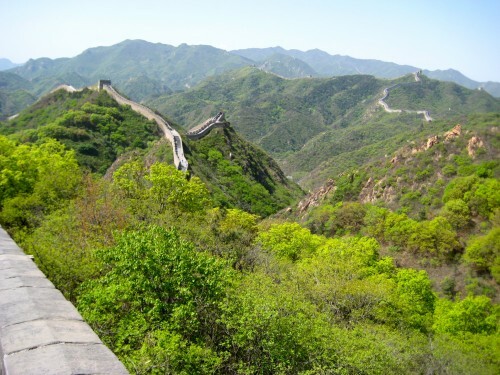 The 919 leaves you at the East section of Badaling. The return bus departs near where it lets you off, a bit past the ticket line for the pulley chairs, as if you were leaving the Badaling East area. There is a small bit of sidewalk cordoned off to form a line – it is more or less obvious. Though other travelers have indicated issues with crowds for the return bus, we had no problem. This is Lea .I have read some of your articals.Very nice and helpful. Glad to see you again on the internet. I also tried to sent you e-mail a few days ago,but it failed.So Maybe you can write to me firstly,then I send you back. Hi Lea! Hope you enjoyed mid-autumn festival. I sent you an email yesterday – hope that you receive it!